For the past six years, I’ve been honored to serve as EY Global Chairman and CEO. My time at EY — including nearly a dozen years on our global executive board – has been one of the most rewarding experiences of my life. Next summer, I’ll be stepping down from my position, and so, as I prepare to attend the World Economic Forum Annual Meeting for my final time as CEO, I’ve been reflecting on how the conversation in Davos has evolved over the years and what that says about the changing role of a global CEO in the 21st century. It’s an understatement to say the world has changed since I took over as CEO in 2013. For example, at one of the first Davos meetings I attended, it seemed like everyone was talking about the potential of new regional trade agreements to drive shared prosperity. Now, many are talking about a potential reshuffling of the entire world order. So, the stakes are getting much higher. Meanwhile, many of the challenges we faced early in my tenure – from rising income inequality to declining trust in institutions – have not changed. Rather, in an age of rapid technological progress and transformative disruption, they have grown even greater and more urgent. Today’s CEOs have to constantly think about how to improve their business models, while simultaneously navigating fast-paced, massive disruption of industries and businesses and a strong undercurrent of uncertainty running through societies around the world. These growing challenges have made it increasingly necessary for global CEOs to adapt the way they lead their companies and, ultimately, to expand the way they think about their roles. Today, businesses are accountable to an increasing number of stakeholders – and everyone from employees to board members are looking to CEOs for a clearer sense of not just where they’re going, but why. That means we need to communicate our vision to stakeholders and convince them that we’re on the right path. Just as importantly, we need to communicate our companies’ values — and we have to back them up with measurable and verifiable action. Why? Because now CEOs speak on behalf of more people than ever, and we’re held accountable in more public ways. With social media, virtually everything a CEO says or does can be instantaneously scrutinized and has the potential to spark a controversy. And in a divisive political climate, our people, our clients and our customers increasingly expect us to speak out publicly when issues arise that conflict with the stated values of our companies. In the last few years, we’ve all seen the pressure businesses have faced when they’ve been perceived to stand on the wrong side of one issue or another. It all impacts an organization’s brand, which is an increasingly important currency. This was on my mind when I joined US President Trump’s Business Advisory Council in 2017. I joined because I believe it’s important to remain engaged with our political leaders. It offered a direct avenue for input, and to make important concerns heard. As a general rule, I think it’s better to be in the room bringing your experience and voice to the debate than outside the room offering criticism. That’s why, although the Council eventually disbanded, I continue to spend a significant amount of time representing EY in public-public initiatives at the global, national and community level. 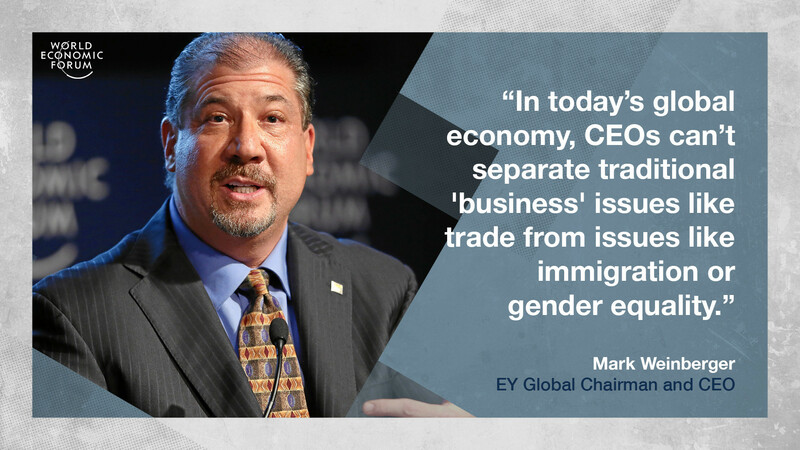 In today’s global economy, that means CEOs can’t separate traditional “business” issues like trade from issues like immigration or gender equality. These issues also profoundly affect our businesses, our people and the communities in which we operate. If we don’t make it clear where we stand, we risk losing the trust of our stakeholders and, in some cases, their business. Moreover, we weaken the sense of community our organizations need and undermine the very values we cherish. Until recently, it was widely accepted that a company’s primary responsibility was to create financial value for its shareholders. That’s who businesses and CEOs were almost exclusively accountable to. While there have always been companies that tried to create benefits for a wider range of stakeholders, this was typically seen as a way to stand out from the pack — not a basic expectation or requirement for success. In today’s rapidly changing world, however, the simple fact is that companies have to create value for many stakeholders in order to succeed. Shareholder value is still critically important – but isn’t separate from a company’s impact on its people, its communities and more. Businesses can fulfill this responsibility in a number of ways. For example, perhaps the most valuable investments any business can make is in its own people. Employees are the ones who execute a company’s strategy, determine its culture and serve as ambassadors to customers and their communities. They look to their employers to educate and empower them – which is why, on an annual basis, EY invests approximately US$500 million and over 13 million hours in employee development and education. This is on top of the important experiential learning and mentoring that’s also provided. We’ve also introduced digital credentials known as EY Badges to help people develop skills related to emerging technologies that will benefit them throughout their careers. Businesses can also increase their social impact by sponsoring educational, mentoring and other community initiatives with other organizations. With a new initiative called EY Ripples, for example, we’re working to help young people gain skills and supporting high-impact entrepreneurs around the world. By 2022, our goal is to mobilize over one million of our own people and networks to make a direct impact on 10 million people and organizations. In each case, creating stakeholder value isn’t just a nice thing for businesses to do, but rather a strategic imperative that ultimately benefits their shareholders, too. When companies invest in their people or communities, it doesn’t just create new opportunities for those who directly benefit. It also helps build a stronger workforce and a better overall business environment, creating a win-win for stakeholders and shareholders alike. As I reflect on my time at CEO, it’s remarkable to consider how much the world has changed—and how much the expectations of global businesses have changed along with it. Today, in an era of transformation and uncertainty, people around the world are looking to the business community for leadership. It’s time for next generation of CEOs to rise to the challenge. Our license to lead depends on it.